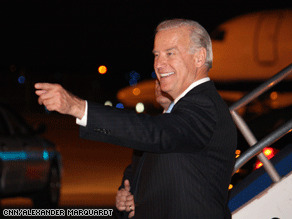 Biden was all smiles boarding his campaign plane after the debate. (CNN) - A national poll of people who watched the vice presidential debate suggests that Democratic Sen. Joe Biden won but also hints that Republican Gov. Sarah Palin exceeded expectations. The CNN/Opinion Research Corporation survey is not a measurement of the views of all Americans, since only people who watched the debate were questioned. Fifty-one percent of those polled thought Biden did the best job in Thursday night's debate, while 36 percent thought Palin did the best job. But respondents said the folksy Palin was more likable, scoring 54 percent to Biden's 36 percent. Both candidates exceeded expectations - 84 percent of the people polled said Palin did a better job than they expected, while 64 percent said Biden also exceeded expectations. But on the question of the candidates' qualifications to assume the presidency, 87 percent of the people polled said Biden is qualified while only 42 percent said Palin is qualified. Biden's running mate, Sen. Barack Obama, was also selected as a winner in a CNN/Opinion Research Corporation about the presidential debate last week.